Introduction. Micromachining Methods. Microfluidic Flow. Sample Introduction. Sample Preconcentration. Separation. Detection Methods. Applications to Cellular/Particle Analysis. Applications to Nucleic Acids Analysis. Applications to Protein Analysis. References. Glossary. Technology. Index. Dr. Paul Li obtained his M.Sc. and Ph.D on chemical sensors with Professor Michael Thompson at the University of Toronto in 1995. He then worked with Professor Jed Harrison at the University of Alberta during 1995-1996 in the field of microfluidic lab-on-a-chip. During 1996-1998, Dr. Li started his first independent research career at the City University of Hong Kong. After joining Simon Fraser University in 1999, Dr. Li continued to conduct research in the areas of microfluidics for single-cell analysis. He is the inventor of four granted patents and five pending patents. He is also involved in analyzing chemical compounds from herbs, especially those with antitumor properties. 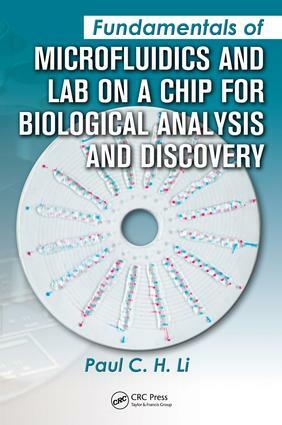 Dr. Li authored a monograph entitled Microfluidics lab-on- a-chip for chemical and biological analysis and discovery in 2006, and has co-authored a book chapter on microfluidic lab-on-a-chip in Ewing's Analytical Instrumentation Handbook, 3rd edition, 2005.